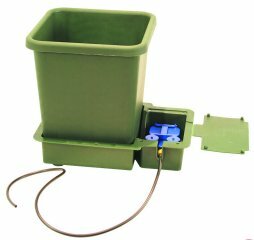 The One Pot System is a single 15 litre pot and tray, which has a separate cavity for the AQUAvalve. The One Pot System is extremely versatile and can be used for a wide range of plant types and sizes. Seasonal flowering plants and perennial shrubs thrive and produce an abundance of blooms and foliage because of the constant even watering and nutrients they receive via the AQUAvalve.